Cruise Weekly: The most feared (and revered) man in world cruising. This is Douglas Ward, a former band leader aboard Queen Elizabeth who worked his way through numerous roles with Cunard (including Cruise Director,) Fred Olsen Line, P&O, Royal Mail Lines, Shaw Savill and Union Castle Lines. He eventually gave up working for them all in 1982, after 17 years on the world’s oceans. In his years at sea, Ward became increasingly interested in the workings of cruise ships and the variations in their offerings and onboard cultures. He became an inadvertent expert and was quickly sought after for his views and opinions and worked with other frequent passengers to form the International Cruise Passengers Association who published the much-read newsletter, Porthole. It’s still published today as fully fledged magazine. 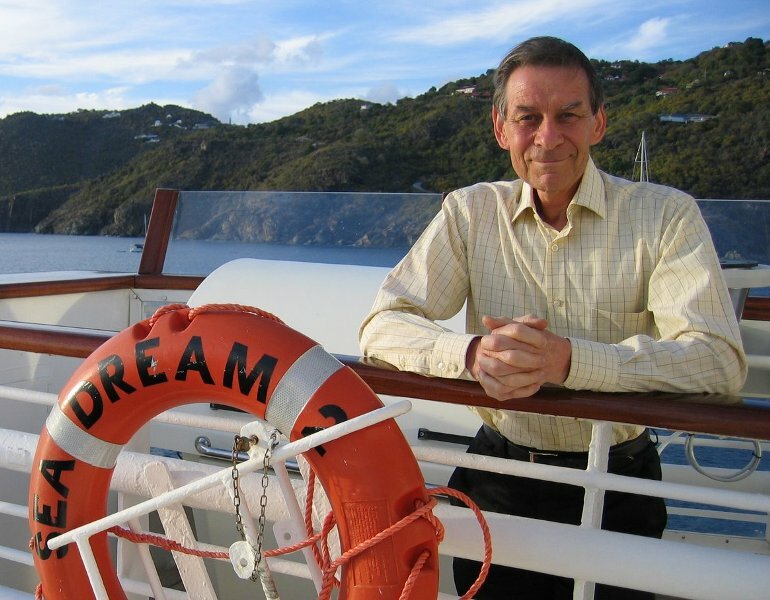 In 1984, Ward was approached by a progressive and forward-thinking travel publisher and asked to produce a comprehensive international guide to cruising. "Our Association by then had over 4000 members and I could see the potential of what the publisher had in mind," Ward says. "It took me 18 months to write the first 250-page guide that reviewed 120-ships. "It was to be updated every three years, but in 1990 we decided to publish it annually. Its 700-plus pages and 500,000 words simply cannot be expanded any further." I’m sure you’ve guessed by now that we are talking about the Berlitz Complete Guide to Cruising and Cruise Ships, now in its 25th year of publication and featuring over 270 ships including the enormous Oasis of the Seas. So much for retiring, Ward still spends around 200 days a year at sea reviewing and rating cruise liners and boutique vessels. His vast experience gives him unparalleled insight into the cruise industry’s developments and trends. In an interview with USA Today’s Gene Sloan, Ward was asked which he considered the most noteworthy of recent in cruise ships. “Celebrity Solstice, because the ship has taken all the elements of Celebrity's former ships, updated them, and added some new ones – such as the first real grass lawn at sea, and a real Corning Glass hot glass blowing studio. The ship also is commendable for using 80 solar panels to provide power for its elevators. Ward goes on to state he looks forward to sampling the new-builds appearing on the market like Ponant’s Le Boreal, NCL’s Norwegian Epic and the tall ship Sea Cloud Hussar, while lamenting some of the passing trends in cruising like sailaway paries, streamers and slipping service standards on some vessels. Like any ratings system, there are winners and losers. Consistent top raters are the smaller luxury vessels like Hapag-Lloyd’s Europa, The Yachts of Seabourn and Seadream Yacht Club, all of which score well over 1700 out of a possible 2000. At the other end, Ward mentions such cellar-dwellers as easyCruise Life, Grande Caribe and National Geographic’s Sea Lion and Sea Bird, all under 800 points total. The 2011 edition is due out in October and until then, cruise industry heavyweights will bite their nails in anticipation. And Ward's last word on modern cruising? "To see better facilities for handicapped passengers, and in this age of less formality, while casual is okay, sloppy certainly is not."